ଆଛୁ ବାବଦରେ ୧୯୧୧ ଏନ୍ସାଇକ୍ଲୋପିଡ଼ିଆ ବ୍ରିଟାନିକାର ଗୋଟିଏଲେଖା ଉଇକିସ୍ରୋତରେ ରହିଛି . 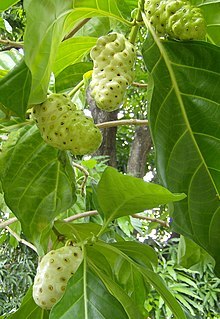 Wang MY, Su C. Cancer preventive effect of Morinda citrifolia (Noni). Ann N Y Acad Sci. 2001 Dec;952:161-8.Department of Pathology, UIC College of Medicine, Rockford, Illinois 61107, USA. mianwang@uic.edu. 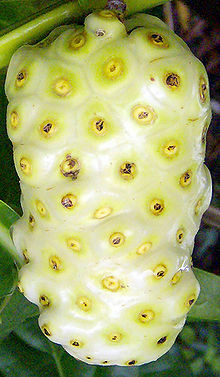 Basar S, Uhlenhut K, Högger P, Schöne F, Westendorf J.- Analgesic and antiinflammatory activity of Morinda citrifolia L. (Noni) fruit. (Institute of Experimental and Clinical Pharmacology and Toxicology, University Clinic Hamburg, Germany)-Phytother Res. 2010 Jan;24(1):38-42. Pachauri SD, Tota S, Khandelwal K, Verma PR, Nath C, Hanif K, Shukla R, Saxena JK, Dwivedi AK.- Protective effect of fruits of Morinda citrifolia L. on scopolamine induced memory impairment in mice: a behavioral, biochemical and cerebral blood flow study. (Division of Pharmaceutics, CSIR-Central Drug Research Institute, Lucknow, India)- J Ethnopharmacol. 2012 Jan 6;139(1):34-41. Epub 2011 Nov 15.